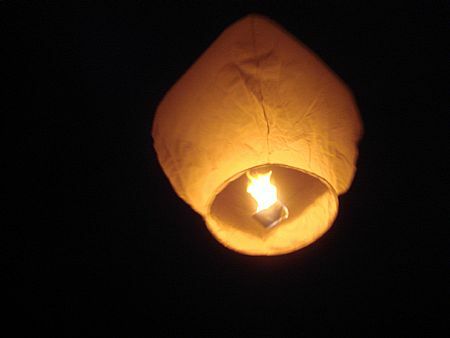 On New Years Eve 10 of us went down to the beach at Porth to mark the start of the new year by launching sky lanterns. The night was amazingly still with a near full moon. The sea was flat and calm. We found a small cove and cave which gave us shlter as we lit the lanterns. They looked amazing as they floated off. As the lanterns floated people either made wishes, resolutions or prayed. I thanked God for the past year, thanked him for the people I was with and ‘wondered with God’ what 2010 will bring. This entry was posted in family, prayer by robryan65. Bookmark the permalink.